Individual arrival in MATERA. Famous for its Sassi and stunning landscapes, Matera, located on the border of Basilicata and Puglia, is not only breathtaking, but fascinating: Its history goes back more than 30,000 years. There are several rupestrian churches open to the public, a reproduction of a typical cave house that you can visit, and refurbished caves made into hotels and restaurants. The sassi districts are a UNESCO World Heritage Site. (If you arrive late at night, we suggest you an extra stay in this wonderful and unique city). Overnight stay in Matera. Bike and road map delivery, route description. Today you will cycle through the southern part of the Murgia to reach one of the most peculiar city in Italy, ALBEROBELLO, universally-known as the capital of the Trulli, distictive, small, dry-stone buildings with a conical roof. 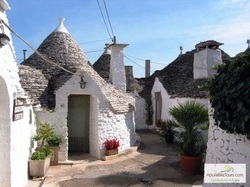 There are about 1500 trulli scattered in Monti and Aia Piccola districts, both listed as World Heritage by UNESCO in 1996. Overnight stay in Alberobello. Today you will ride over the hills dominating the Itria Valley. Nature lovers will not be disappointed: With its still expanses of olive trees as far as the eye can see, the Itria Valley is red soil, green groves and vineyards, and white trullo houses under a serene blue sky – essentially, a marvelous chromatic effect that repeats itself several times over. Before reaching your final destination, we suggest you to stop first in LOCOROTONDO for a typical Italian aperitif and tasting the white wine produced in this region, second in MARTINA FRANCA, for a short visit to its marvellously intact historic centre, its beautiful square, and stunning Palazzi, and last but not least in CISTERNINO for a lunch break, maybe in one of its typical butcher shops, where you can choose the meat you want to eat and they cook it for you. Finally you'll cycle to OSTUNI, the White City, whose whitewashed arches and houses shine like a pearly white tiara, extending across three hills with the magnificent gem of a cathedral as its sparkling centrepiece. Overnight stay in Ostuni. Leaving Ostuni and cycling through its beautiful countryside, you will come cross small towns such as SAN VITO DEI NORMANNI, MESAGNE, and ORIA where you will be enchanted by their marvellous Frederick's castles. Then the tour will take you to your final destination of the day: MANDURIA​. Don't miss the possibility to taste the red wine produced in this area: Primitivo. Overnight stay in Manduria. This stage is dedicated to the west coast of Salento, where you'll cycle towards Campo Marino, Porto Cesareo, up to GALLIPOLI. The island heart of Gallipoli is home to numerous impressive Baroque churches and aristocratic palazzi, testament to the town's former wealth as a trading port. A labyrinthine weave of narrow streets all eventually lead to the broader sea-front promenade with its wonderful views. Overnight stay in Gallipoli. Leaving behind Gallipoli you'll cycle along the Ionian coast headed to Torre San Giovanni. Here the crystal clear sea will tempt you…but it’s time to get back on your bike! A short detour will take you inland to see the small towns of UGENTO and SPECCHIA, one of the most beautiful 'BORGHI' of Italy. Then you will continue your ride for another 35 km reaching SANTA MARIA DI LEUCA, where the Ionian and the Adriatic Sea meet; this is the southernmost point in Salento, striking the visitor’s eye for its colors and unreal silence. Overnight stay in Santa Maria di Leuca. 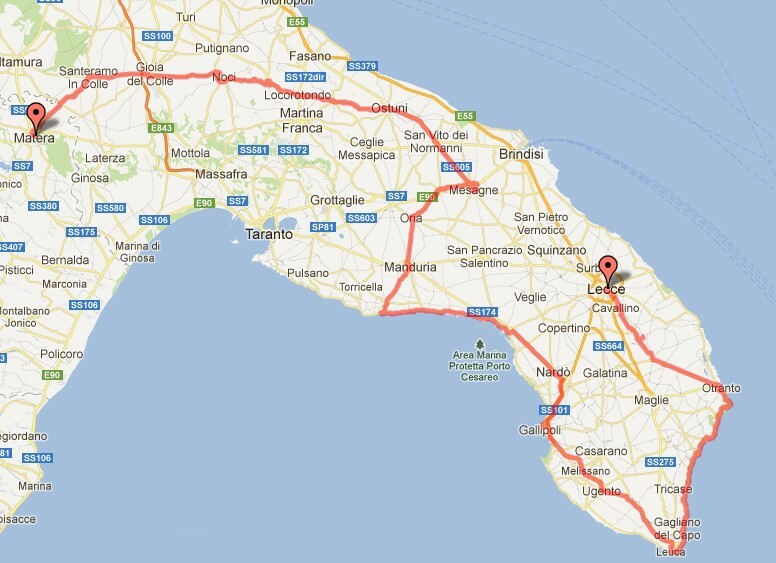 Today you'll start riding northward along the beautiful coastline of the Adriatic Sea. Crossing the marinas of Tricase Porto and Castro Marina, you'll finally get to one of the most amazing city of Salento: OTRANTO. If you want you can have a delicious seafood dinner and take a walk throughout the historic centre and maybe buy some souvenirs from the local little shops. Overnight stay in Otranto. In the morning, if you want, there's time to visit the city. Otranto is best appreciated in its amazing cathedral, where the bones of 813 martyrs are displayed in a glass case behind the altar. Less macabre is the cathedral’s other jaw-dropper, its medieval mosaic floor, which rivals the famous early Christian mosaics of Ravenna in its richness and historical significance. Cycling along the Alimini Lakes, you’ll finally reach the seaside village of TORRE DELL’ORSO: don't miss the opportunity to swim in the suggestive Grotta della Poesia. Before arriving in LECCE you will meet ACAYA, a perfect stop for an authentic Italian espresso or for a drink at sunset in front of the castle. Overnight stay in Lecce. End of services and goodbye. (If you leave early in the morning, we suggest you an extra stay in Lecce, one of the most interesting cities in the region for its baroque architecture, typical of the 17th Century).